--Dublin Statement on Water and Sustainable Development, Jan. 1992. Wetland conservation is an issue that has often been overlooked in environmental policy-making. Yet water is so utterly vital to life, it is hard to understand why this is so. After all, what is it that the Mars Rover missions have been seeking on that planet in order to find out if life ever existed there? Of course, the answer is water! The world’s population uses approximately 30% of all available fresh water per year. 70% of this is used for agricultural purposes. Although the surface of the earth is mainly comprised of water, at the same time, less than 1% of all the water on earth is fresh water which is suitable for drinking. In fact, 20% of the entire population on earth does not have access to safe drinking water. The fact is that our planet is facing a water crisis. By the year 2025, the need for water for agricultural, sanitation, and industrial use is expected to increase by 47% due to a growing human population. In the US alone, the average person uses 600 liters of water per day, compared with 85 liters per day for someone living in a country like Jordan. 150,000 liters of water are required to produce a single car!! The overuse of water threatens freshwater ecosystems and the communities that depend on them for their way of life. These ecosystems serve as natural water purification systems, which are often more efficient than human made irrigation systems costing millions of dollars. 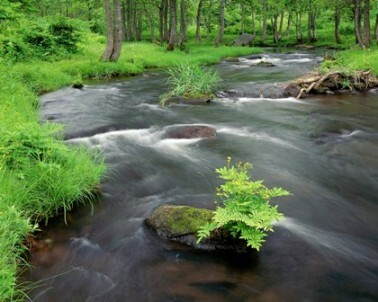 Wetland conservation and the continued existence of healthy freshwater ecosystems such as rivers, lakes, and streams are necessary for human life to exist on this planet. The fresh water from these natural sources is used in farming and agriculture, for electricity, city living, and sanitation. In fact, the sheer economic value of our wetlands in the form of goods, services, and recreation is estimated to be around US $87 billion dollars per year. It is imperative that we learn to conserve water as much as possible. Wetland degradation and pollution threatens the availability of clean water to rural communities throughout the world, as well as increasing the risk of flooding. The lack of clean water is also responsible for killing millions of people each year from waterborne illnesses. In addition, our wetlands are home to a diverse population of animals, plants, fish, amphibians, birds, and human communities. Changes to these ecosystems threaten both the biodiversity of these areas as well as human livelihoods. The most important solution to the global water crisis is water conservation. Using less water and an increased awareness of the earth’s limited water supply is imperative. This is particularly true in the west, where we tend to take it for granted that water is always readily available to us, unlike our neighbors in many other parts of the world. Conservation efforts are also directed toward wetland protection, along with research and the development of ways to efficiently manage our water resources. This includes the artificial construction of wetlands as well as water saving techniques. The practice of rainwater harvesting for a variety of domestic purposes such as lawn care, farming, gardening, flood prevention, and other uses also has the potential to increase and sustain our water supply into the future. 1. Find out more about how you can conserve water by visiting Water Saver Home here. 2. Visit rainwaterharvesting.org – This is a wonderful and comprehensive site about, well, you guessed it, rainwater harvesting techniques! 4. www.cleanwateraction.org – National organization devoted to "...clean, safe and affordable water for all Americans, now and for the future." 6. Visit our Ways to Go Green section for more tips on how to conserve water and other things you can do to help protect our planet.